The first time I saw Liz Smith, she was dressed as a swashbuckling grandma in the CBBC series, Pirates, about a family of pirates who decide to settle on dry land in a normal family house. The series was fun and the characters were always getting into trouble. The second time I saw her, was when she walked past me at her local shops near Hampstead Heath. As a child I was so excited that I had just seen Grandma Pirate in the flesh, but was much too nervous to speak to her. Since then, she has been hard to miss. She pops up everywhere with either quite small parts or much larger roles, such as Nana in The Royale Family, who managed to capture the heart of a nation. I never actually got into The Royale Family, but have always enjoyed watching Liz Smith on screen. She is so funny and seems natural in any role that she chooses. Similarly, her writing also feels very natural. I can almost imagine she is sitting with a cup of tea, chatting away about her memories of childhood and telling small anecdotes about her adult life. 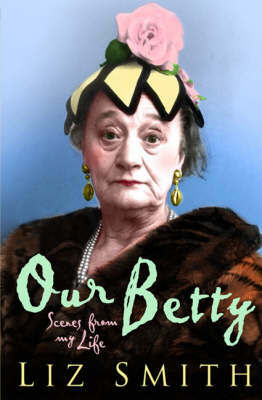 As it says on the front cover, the book really does feel as though we are seeing scenes from Liz Smith’s life. Her memories are told in short snippets, some only a few paragraphs long and others a few pages. Each story is warm and full of Smith’s thoughts and ideas. We find out that she enjoys cooking, learning the importance of food from her grandmother. We read about how she fell in love with cats, and being a cat person myself, I immediately like her a little bit more because of it! Liz also tells about the wonderful moment that, when receiving a phone call from Mike Leigh at the age of fifty, her acting career properly began. After years of making ends meet, it was a dream come true to finally earn a living doing what she loved; acting and making people laugh. Reading the second half of the book, it is impossible not to see the passion that Liz has for her career and how much she has enjoyed working with all the people she has met. She has many friends, and when reminiscing about her time as Nana in The Royale Family, she even goes as far as to say that the cast felt like her family. I imagine Liz Smith to be just like her book, warm, friendly, smiley, funny and a lovely person to listen to. Buy this by clicking the picture below.